Please type your desired tags, e.g. Hypoxia, Fibrosis, Criminology & Criminal Justice, Public Policy, Cognition and Neuroscience, MRI, Animation & Games, Emerging Media Art, Technical Communication, Consulting, Grant Writing, Business Communication, American and British Women’s Literature, Eighteenth century French intellectual and literary history, Genre theory, and etc. Multi-port power electronic interface (MPEI) for effective harvest, storage, and management of energy within a hybrid micro grid. Double stator Switched Reluctance Motor Technology for electric propulsion of electrified transportation. Position sensorless control of SRM and PMSM drives. Fault tolerant operation of adjustable speed PMSM drives. Elimination of acoustic noise and vibration using multi-physics modeling techniques. Optimal magnetic design of electromechanical energy converters. Optimal design of power electronic converters for micro harveters of energy harvesters. 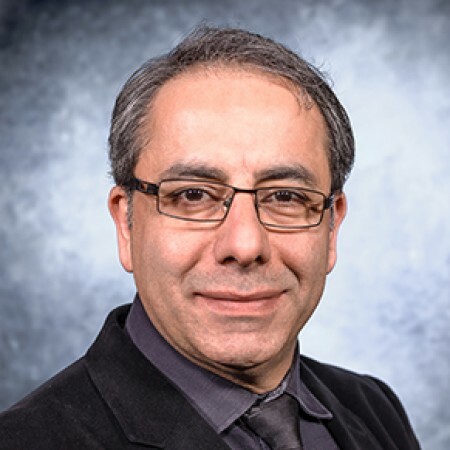 Dr. Fahimi's research can be found in the form of over 190 peer reviewed journal and conference articles, 4 issued patents (7 more pending), several book chapters and technical reports. He has supervised 8 PhD and 14 M.S. thesis to completion. His former students are all industrial and academic leaders (three assistant professors). Keynote speaker at IEEE-ESARS 2012, Bologna, Italy, October 2012. Technical Program Chair, Inaugural IEEE International Transportation Electrification Conference and Exposition, Detroit, MI, June 18-20, 2012. Plenary speaker at IEEE Applied Power Electronic Conference and Expo, Orlando, February 2012. Keynote speaker at IEEE Vehicle Power and Propulsion Conference, Chicago, September 2011. Recipient of the Fulbright Scholarship for Summer 2011(at RWTH –Aachen, Institute for electric machines). Distinguished speaker in IEEE Vehicular Technology Society, 2011-2013. Guest editor for the special section of IEEE P&E Magazine on Electrification, July 2011. This issue has won the APEX Grand Prize. Recipient of Ralph Teetor Educational Award from Society of Automotive Engineers, April 2008. Keynote speaker at IEEE International conference on electric machines and systems (ICEMS), South Korea, October 8-11, 2007. Keynote speaker “ Monitoring and fault diagnosis of DC-DC multistage converter for hybrid electric vehicles”, IEEE SDEMPED 2005, International symposium on diagnostics for electric machines, power electronics, and drives, Vienna, Austria, 7-9 September 2005. Recipient of the 2nd prize paper from IEEE-IAS Transactions, in 2006. General Chairman of 2010 IEEE Applied Power Electronics Conference and Exposition (APEC), Palm Springs, CA. General Chairman for IEEE Vehicle power and propulsion conference in 2007, Arlington, TX. Technical Program Chair for IEEE-APEC in 2009, Washington, DC. Technical Program Chair for IEEE International Conference on Electric Machines and Drives (IEMDC), 2005, San Antonio, TX. Guest Editor, Special section of IEEE Transactions on Industrial Electronics on switched reluctance machines. Guest Editor, Special issue of IEEE Transactions on Industrial Electronics on adjustable speed motor drives. Guest Editor, Special issue of IEEE Transactions of Vehicular Technology on electromechanical energy converters in automotive applications. Recipient of the Office of Naval Research young investigator award, 2004. Recipient of the IEEE Richard M. Bass outstanding young power electronics investigator award from IEEE Power Electronics society, 2003. Recipient of a 2 years DAAD (German academic exchange program) fellowship(1993-1995). Listed in Marquis Who’s who 2005 and 2006 in engineering and science. Graduation with the highest distinction in BSEE, and MSEE at University of Tehran, Iran, 1991 and 1993 respectively. Presented a seminar on Hybrid Electric vehicles to Society of professional engineers in DFW. Presented a seminar at Academy Junior High school in Fort-Worth to 8th grade students. Presented a seminar to Mid-Cities Engineering society on Hybrid Electric Vehicles. Chairman, Power Electronics committee of IEEE Industrial Electronics Society, 2011-2013. Member of AdCom in IEEE Industrial Electronics Society, 2010-2012. Chair, 2009 International Future Energy Challenge, IEEE-PELS. Senior Member, Institute of Electrical and Electronics Engineering (IEEE). Organizer, 2007 International Future Energy Challenge, Topic-B, Integrated Starter/Alternator, IEEE-PELS. Chairman, Electric machines and drives committee of IEEE Industrial Electronics Society. Chairman of the standards subcommittee in IEEE Industry applications electric machinery committee. Editor in Chief, IEEE PELS newsletter, 2012- present. Editor, IEEE Transactions on Energy Conversion. Associate Editor, IEEE Transactions on Industrial Electronics. Associate Editor, IEEE Transactions on Power Electronics. Associate Editor, IEEE Transactions on Vehicular Technology. Associate Editor, Korean Institute of Electrical Engineers. Member of the editorial board for international journal of electric power systems and components. NSF Panelist for proposal review, Power Systems and power electronics, and SBIR 2001, 2002, 2003, 2005, 2006, 2007, 2008, 2009, 2012. Member of Society of automotive engineers (SAE). Member of the steering committee of IEEE-VPP conference, 2008-2010. Chairman of the steering committee, IEEE-APEC 2011. Member of the steering committee, IEEE-IEMDC 2008-2012. A UT Dallas researcher has developed a key element in the renewable energy equation: a prototype electronic interface that routes power from renewable sources to the power grid and electrical storage facilities. 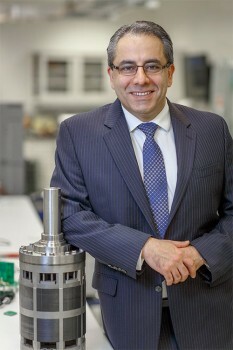 “Our Multi-Port Power Electronic Interface guarantees optimal energy harvesting from solar panels and wind turbines,” said Dr. Babak Fahimi, a professor of electrical engineering in the University’s Erik Jonsson School of Engineering and Computer Science. “This converter utilizes an adaptive controller to optimally increase efficiency and reliability for each operational condition while performing energy management algorithms to ensure the best performance.” Five years in development, the converter would be perfect for use by small to medium-size businesses, large residential buildings and shopping centers that decide to make an investment in renewable energy, Fahimi said. 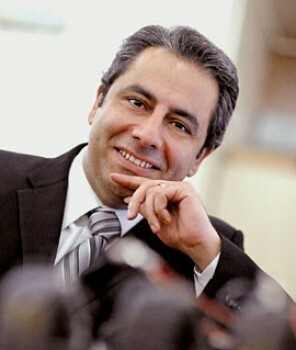 Renewable energy leader Dr. Babak Fahimi, a professor of electrical engineering in UT Dallas' Erik Jonsson School of Engineering and Computer Science, has been elected a fellow of the Institute of Electrical and Electronics Engineers (IEEE), the world's largest professional association for the advancement of technology. Fahimi has been teaching and conducting research in the power electronics area for almost 20 years. A team from the Renewable Energy and Vehicular Technology Laboratory(REVT) at UT Dallas was one of a few research groups selected for advanced participation in a Department of Energy conference aimed at presenting the next generation of energy technologies. The DOE’s Advanced Research Projects Agency-Energy (ARPA-E) program hosts an annual summit in Washington, D.C., for researchers, entrepreneurs, investors, corporate executives and government officials to share transformational research funded through the program.